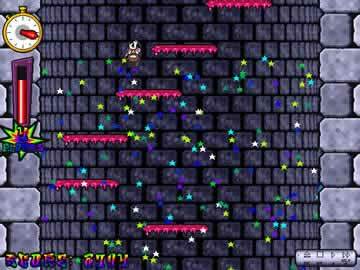 Icy Tower Game Review - Download and Play Free Version! Play Harold the Homeboy as he and his friends try to climb the tower without falling down! Climb to the heights of the heavens on an Icy Tower? Harold the Homeboy is struggling! He needs your help to climb an Icy Tower! You will jump from platform to platform up and up and up the tower. If you miss one, you will fall down and down and down. Download characters such as Bart Simpson, Sonic, Mario, Guybrush Threepwood, Kirby, a worm (PC Game Worms) or make up your own characters! It is an easy process and a lot of fun to see the character you designed in this game trying to scale the tower. This game, though free, is very addicting. You will try and make it up the 100 floors each time you play and wonder why you can't seem to make it all the way up the Icy Tower. Download this game for hours of free fun and challenges! More addicting games here. 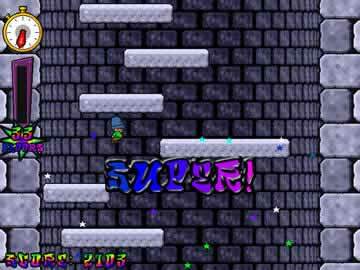 Icy Tower is a fun and challenging arcade game that will you have jumping from platform to platform as you race up an unbelievably tall tower. See how high you can make it or go for the largest score as you move further and further up. You can save and watch replays of your best attempts or find out where you messed up on bad ones. Adjust a variety of options to create an experience that's perfect for you in the Custom Mode. Best of all, it's completely free. 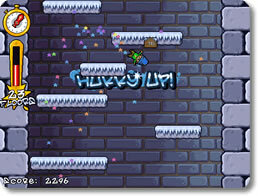 In Icy Tower, you start at the bottom of a tower and must work your way upwards by jumping from platform to platform. These platforms range from very wide to barely large enough to stand on. Each platform is a floor in the tower (so the 100th platform would be floor 100). As you make your way up the tower, the screen scrolls downward at an increasing rate. If you don't keep moving up the tower fast enough, the bottom will overtake you and the game will end. To help you move up the tower faster and earn more points there are “combos”. Combos are performed by building up your characters speed (by running fast enough, bouncing off walls, falling, etc.) and jumping. A combo is a jump from one platform to another platform at least two floors above. Combos can be “chained” in one bigger combo if you keep making large jumps in quick succession. It's a great way to increase your score dramatically and quickly move up the tower. While Icy Tower does not provide different levels or towers to play, it does offer two modes. The Classic Mode is the normal gameplay that has you jumping from platform to platform as the screen scrolls faster and faster. This mode also has a profile for your character that tracks things like largest jumps or combos, and has a rank for you based on your accomplishments. Your rank can be increased by meeting certain objectives (such as getting a 15 floor combo). Custom Mode is almost identical to Classic Mode, except that it gives you more options and does not count towards your profile or rank. You can change the scrolling speed of the screen, platform size, and the strength of gravity to create an extremely easy or incredibly challenging platform jumping experience. One downside is the lack of options to adjust the difficulty settings. There's no way to make the game any easier or more difficult. You can play the Custom Mode and adjust some settings, but some can't be made easier (like scrolling speed) and nothing you in this mode counts towards your profile or rank. While it's not a huge issue or setback, it would have been a nice addition to have some difficulty choices (like easy, medium, hard, etc.). One positive aspect of the game is the relatively simple controls. You'll only need to learn a few keys to start playing the game. The arrow keys can move you left or right while the space bar makes you jump. The controls and combos are clearly outlined in the instructions of the game. Additionally, you have the option to customize the controls and change them to something more comfortable for you. The presentation in Icy Tower is positive overall, with clean and colorful graphics that look very good, especially compared to similar games. There is also a decent (although limited) soundtrack that complements the gameplay well. The only negative aspect may be the sound effects played when jumping. These sounds can quickly become annoying, but can be disabled if you choose. Another issue with the game is the repetitive nature of the gameplay. In both modes you are constantly jumping from platform to platform until the game ends. It can get a bit boring after playing for a while. On the other hand, the profile and ranks do give you something to work toward and a reason to replay. You might want to keep going for a new high score, or to reach a new floor. You could work towards earning the next ranking by achieving whatever objectives you need. Icy Tower is a great way to kill some time, but whether the game lasts long will depend on the type of player you are. Icy Tower is great game that would be an excellent choice for anyone interested in a simple, fun, addicting arcade game. While it has drawbacks such as repetitive play and a lack of difficulty settings, those are far outweighed by the positive aspects. All of your stats and scores are tracked in a profile, letting you see your best jumps, scores, and floors. You can work towards improving these stats or towards a new rank to show just how skilled you are. Save or watch replays of any of your games. Adjust the settings in Custom Mode to create a game that's right for you. Considering it's free, there's no reason for anyone not to at least give the game a shot.